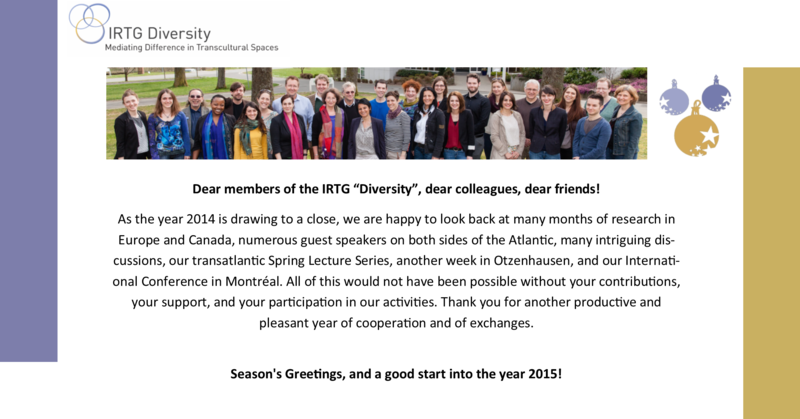 Dear members of the IRTG “Diversity”, dear colleagues, dear friends! As the year 2014 is drawing to a close, we are happy to look back at many months of research in Europe and Canada, numerous guest speakers on both sides of the Atlantic, many intriguing discussions, our transatlantic Spring Lecture Series, another week in Otzenhausen, and our International Conference in Montréal. All of this would not have been possible without your contributions, your support, and your participation in our activities. Thank you for another productive and pleasant year of cooperation and of exchanges. Season's Greetings, and a good start into the year 2015!